Keep checking this page for the latest announcements and other timely information of interest on gender norms. Visit the events page to see what ALIGN is up to, plus wrap-ups and summaries from past events. 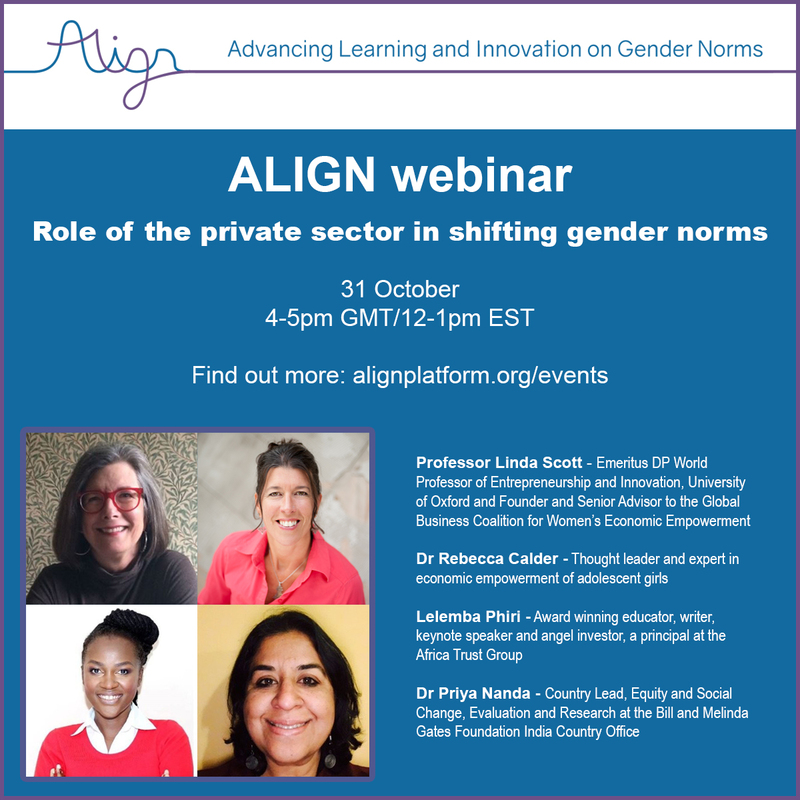 Join us for a webinar on the role of the private sector in shifting gender norms - 31 October 4-5pm GMT/12-1pm EST. During the webinar, experts from the private, non-profit and philanthropic sectors will explore the nature of some of the work the private sector is undertaking to address gender norms; address some myths and misperceptions concerning private sector involvement in women’s economic empowerment and gender norm shifting; and highlight opportunities and ways forward for the greater engagement of the private sector in shifting gender norms, as well as greater understanding of and collaboration between the development and the private sectors. This webinar will highlight the findings from the recently published ALIGN report "Private sector involvement in development: What impact on gender norms?". During May-June 2018, ALIGN held a call for applications for its convening fund to support global meetings on gender norms, and expects to run a second round of convening funding in spring 2019. Read who we have awarded funding to and more about their initiatives. ALIGN launched its first research fund in December 2018, and expects to run a second round of research funding in spring 2019. With a total amount of £90,000, the first round of ALIGN’s Research Fund made six awards, exploring a range of themes from education to media and gender norm change in highly varied contexts. Find out more. We are pleased to announce our new blog is now live. The ALIGN blog captures diverse and topical opinions on gender norms change from across our Community of Practice. The first entry explores highlights from the recent Social and Behaviour Change Communication Summit in Bali, Indonesia, by Rachel Marcus. If you have an idea for a blog, contact us. Adolescence is a pivotal time in a girl's life. The development of educational, physical, psychosocial, familial, political and economic capabilities enable girls to reach their full potential and contribute to the wellbeing of their families and society. However, progress is still significantly constrained by discriminatory gender norms and the related attitudes and practices which restrict girls’ horizons, restrain their ambition and, if unfettered, allow exploitation and abuse. Empowering Adolescent Girls in Developing Countries explores the detrimental impact of discriminatory gender norms on adolescent girls’ lives across very different contexts. Grounded in four years of in-depth research in Ethiopia, Nepal, Uganda and Viet Nam, the book adopts a holistic approach, recognising the inter-related nature of capabilities and the importance of local context. By exploring the theory of gendered norm change, contextualising and examining socialisation processes, the book identifies the patriarchal vested interests in power, authority and moral privilege, which combine in attempts to restrict and control girls’ lives. This book is edited by ALIGN project lead Dr Caroline Harper (ODI Principal Research Fellow and Head of Programme, Social Development) and features contributions from ALIGN project collaborators including Rachel Marcus (ODI Senior Research Fellow), Dr Nicola Jones (Director, GAGE programme) and Dr Fiona Samuels (ODI Senior Research Fellow), plus research partners in the Global South. The Open Access version of this book, which can be accessed here, has been made available under a Creative Commons Attribution-Non Commercial-No Derivatives 4.0 license.